Probably, many of you wonder what kind of test is performed to determine if a marijuana strain has significant rates of the main cannabinoids, as well as the method used to know the precentatge (more or less accurate, as we will see) of each cannabinoid contained in the tested sample. In this post we will explain step by step how to do a thin-layer chromatography (TLC), an analisis that will show us the approximate percentages of the main cannabinoids detected in each sample. To do this, we used eight different samples of the marijuana strain Fruity Jack / Jack el Frutero from Philosopher Seeds, with the simple purpose, in this case, to know which of the analyzed phenotypes have high amounts of the cannabinoid CBD. The medical use of marijuana is constantly gaining ground in the past few years, as well as the interest from breeders and consumers to know the exact amounts of cannabinoids present in their favourite cannabis strains. That’s why expressions such as “thin-layer chromatography” or “gas chromatography” are becoming more and more familiar for the cannabis community. To learn more about these analysis systems, we met with a good friend and collaborator who explained us a system based on the thin-layer chromatography with which we get reliable results quickly and safely for our health. Before starting, we should know be aware of the basic security measures in laboratories when using chemicals, and of course follow them. Also, this goes for any kind of experiment, you should try to do it in place as clean and sterile as possible, thus avoiding contamination that could alter or distort the results of the test. 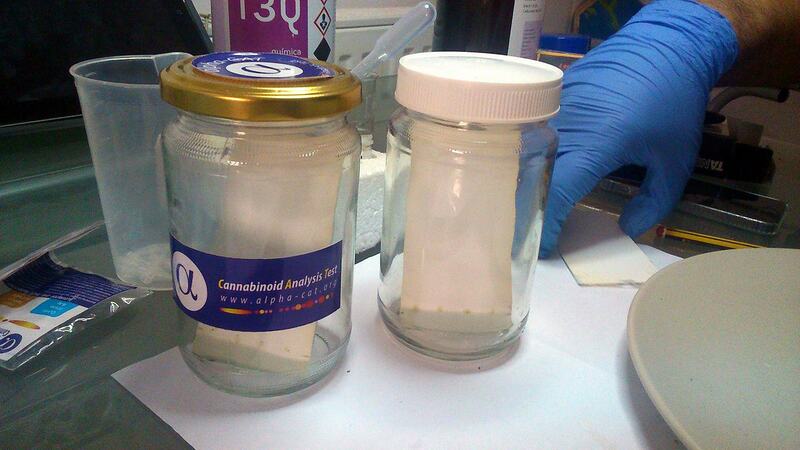 For the preparation, you should mix 1ml of solvent (Hexane) for each 0.1 gr of cannabis sample in an Eppendorf tube. Shake for 20 seconds and let it rest a minimum of 3 minutes before continuing. During the whole process, our partner warns us of the importance of a correct and cautious labeling of each sample, because otherwise it’s easy to get confused and mix up results in case you want to make several analyses. Once the sample is prepared, collect 0.2 micro-liter with the micro-pipette and deposit them in the point that we have previously marked with the pencil on the underside of the plate. For our analysis, we will use a plate for each four phenotypes of Fruity Jack / Jack el Frutero to be tested, using a total of two plates per 8 samples. 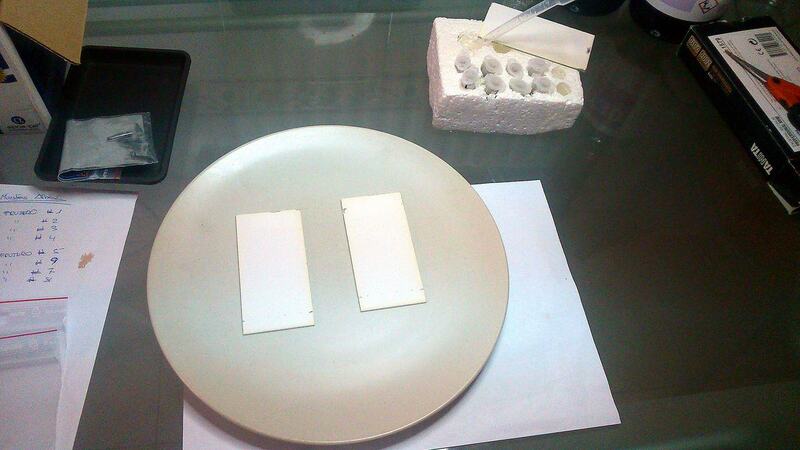 We put the eight micro-drops on the two plates (4+4), so we already have our samples prepared for the next step. Now, we must proceed to decarboxylate the samples. To do this, we place the two plates with the eight droplets in a Pyrex tray, which we put in the oven at 120-140°C during 5-10 minutes. 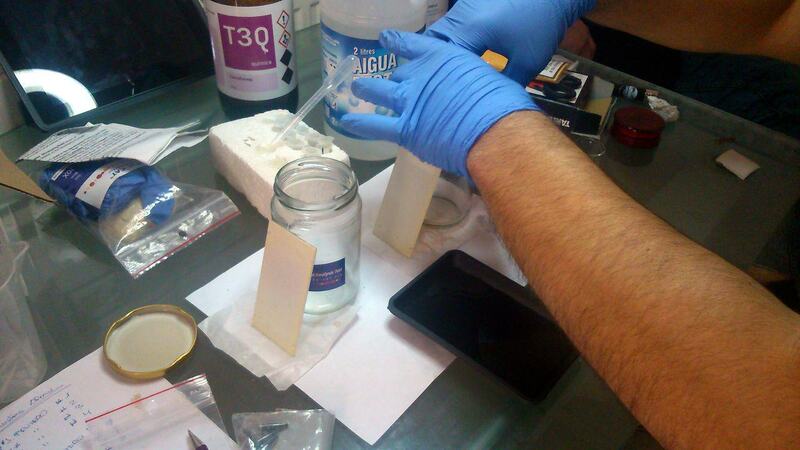 Then, we will prepare two glass jars (one for each plate) filling each of them with 2ml of chloroform. With great care place the plates inside the jars so that only the underside of the plates – where the droplets are – is in contact with the eluent. It’s important to observe how the eluent is abdorbed by the plate; in case it doesn’t do it in a uniform way, we probably should discard the results of this sample; this is often the case when old or damaged plates are used. When the chloroform has rose up, it leaves a trace in the form of spots (still not visible) for each of the main cannabinoids. 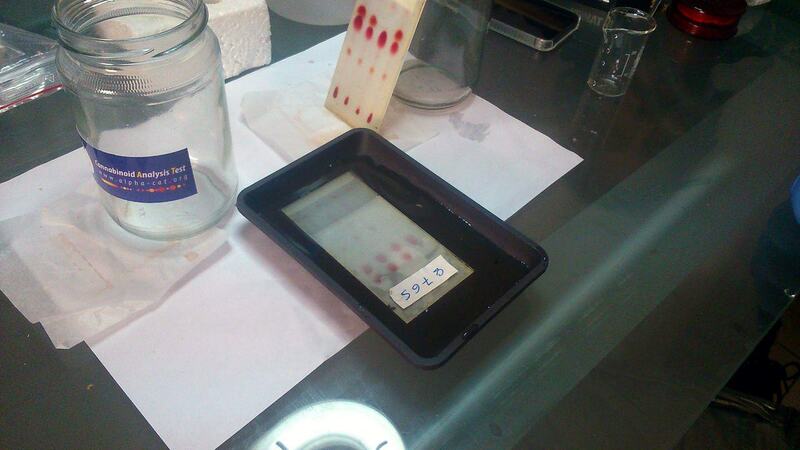 Later on, these spots will indicate us the approximate percentages of each cannabinoid in each sample. Allow the eluent to completely cover the plate until it reaches the upper edge (about 30 minutes). Remove the plates carefully and leave them 5 minutes on the blotting paper in vertical position, with the pencil marks on the lower part. 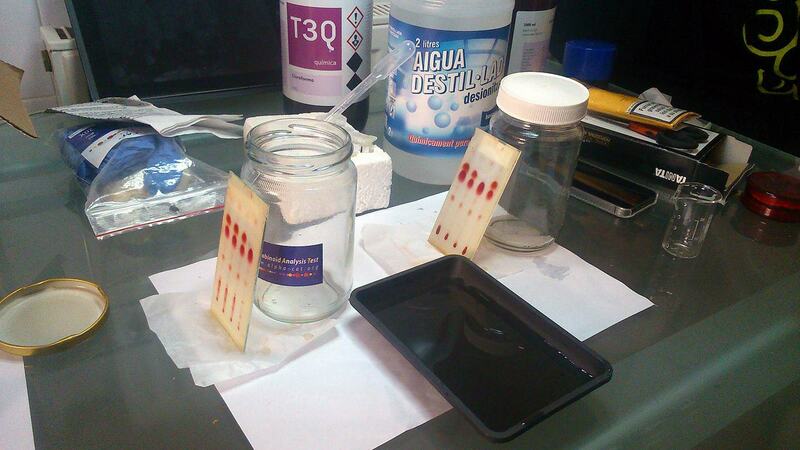 Meanwhile, we msut prepare the mixture with the reagent to make the spots visible. For this process there are different methods, from UV light to specific reagents that allow us to colour the spots. We have chosen the most common option: pour 20 ml of distilled water in a plastic tray and add 0.1 g of a reagent – salts – called Fast Blue B (C14H12N4O2Cl2 • ZnCl2) . Shake the mixture until it’s even and all salts are dissolved in the distilled water. Now all you have to do is soaking each plate in the tray for just two seconds (you also can spray the mixture over it, but it’s much better for your health to submerge them, even if you use more liquid). 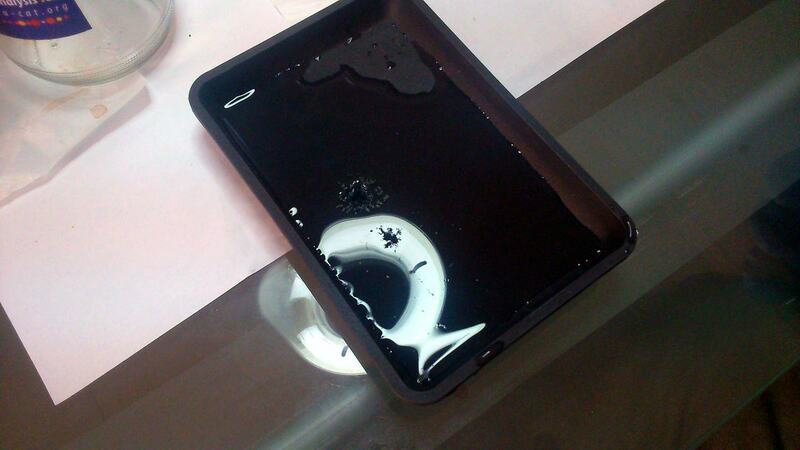 Take it out and leave it again on the blotting paper, always in vertical position and with the spots at the bottom. 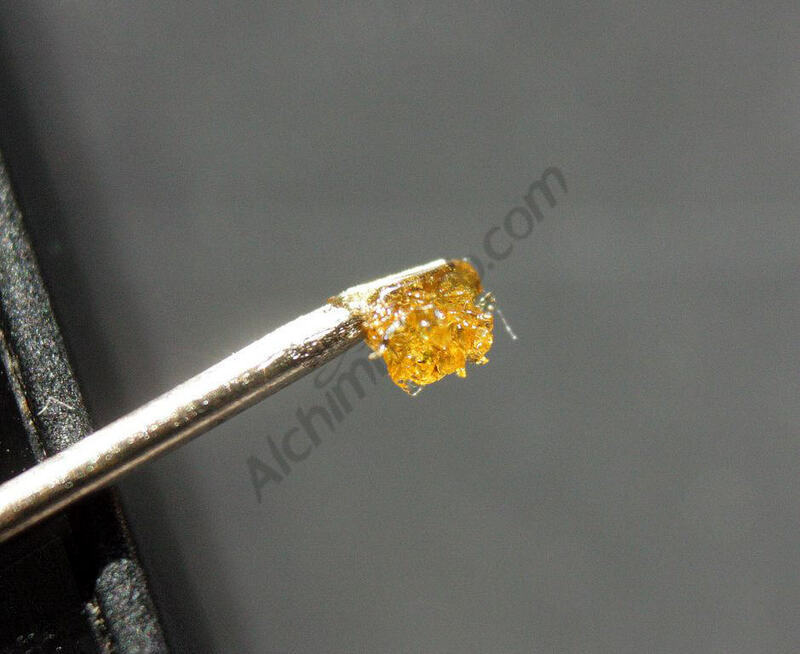 After a few seconds, a number of spots will appear along the plates, showing the presence – or absence – of certain cannabinoids (THC, CBD, CBN, CBG, THCV, CBC), as well as its approximate content. Each cannabinoid has its own colour and position on the plate, so it’s easy to know if a specific cannabinoid is present in the sample. Its content is determined by measuring the diameter of the spot and comparing it with a conversion table that will give us an approximate content (%). 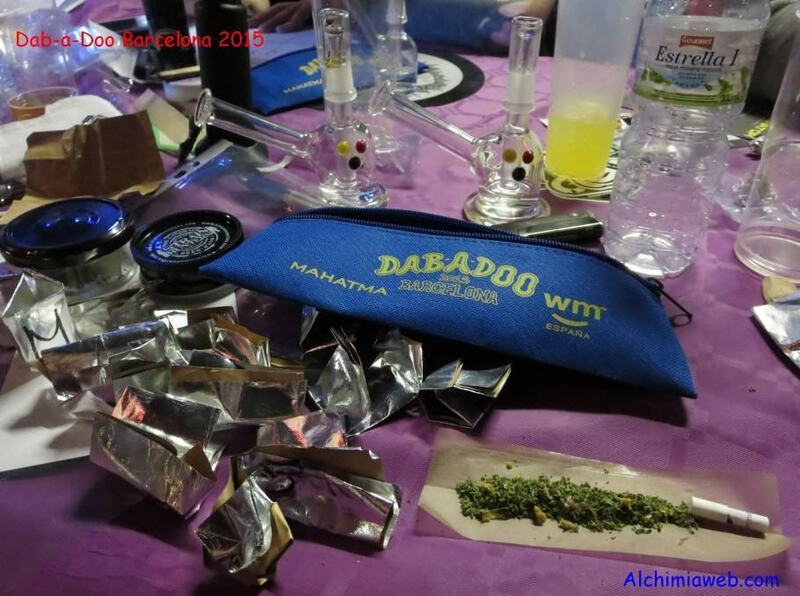 We use the table included in the cannabinoid test kit from Alpha-Cat. Despite this system is not as accurate as the gas chromatography, it seems a good method for an approximate determination of the cannabinoid content present in a sample. In our case, for example, it has been very useful because the only thing we wanted was to know which of the eight analyzed samples contained high CBD rates. For the happiness of many medicinal marijuana users, six of the eight analyzed phenotypes have shown remarkable CBD contents. The system is especially useful in processes of selection and breeding, since it allows us to know which phenotypes we want to keep with no need for costly gas chromatography analysis. With this method, anyone can do its own analysis at home and know, for example, what phenotypes contain CBD or which of them has higher THC content. 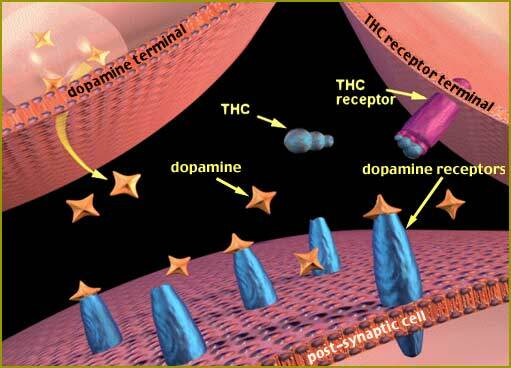 The more you think about it, the more applications seem to have this type of analysis, especially for the selection of individuals in relation to their specific cannabinoid content. It is also useful to test different flowering times, to know the perfect time to harvest marijuana plants, to test fertilisers or substrates, etc. You can perform test crops with clones and see which contents are obtained in each sample, find a phenotype that has a certain balance between its different cannabinoids, etc. The possibilities, as we say, seem abundant; although it should always be kept in mind that the results don’t have the accuracy of gas chromatography analysis. Either way, they can be useful to know which specific phenotypes we want to study more in-depth. We wish you happy analysis and good vibes. Well, for myself, it sounds like a lot of extra work, not to mention finding all of that stuff. It’s difficult for me to keep up with all I do now, it seems like I’m constantly busy with something to do with my grow. For me, I either like what I’m growing, or I don’t. If I don’t, I move on. But, for someone like my cousin, this may be a big help to him. His son has Autism and the state approved his petition to use medical marijuana to treat his son, so he is constantly working at fine-tuning things for those treatments. I know at least once he’s brought samples of the stuff he’s growing for his son to someone else to be analyzed, I imagine he’d like to have a way to do it himself. I’ll be telling him about this post. Thanks for telling your cousin about this method, it is much easier and cheaper than gas chromatography and, while not being as accurate as the GC, it tells you what cannabinoids are found in your sample, with an approximate % content. Very useful for both breeders and medical patients. Hey I’m sorry but what would the chemical be that’s the same color as CBD is but it’s popping up below THC instead of above it ??? There’s acids… then purple then light orange then dark red … then random marks … I know the dark red is thc .. but all the pics and examples I see say cbd is above but CBG is yellow ? I don’t get this I used cannalytics ? THCV is pink, and CBG is orange. Where can I purchase the supplies? Here you can purchase the Alpha-Cat analysis kit, with which you have everything you need to analize your samples. As long as they are made for TLC, they should work properly. Sorry, I don`t see how can you figure it out the % of CBD or THC in the sample. Hi Tiago, thanks for your question. The levels of THC or CBD are worked out by comparing the position and size of the spots on the test sheet with the pre-printed chart that’s provided with the test kit. According to the size, the chart can tell you what the percentage of each cannabinoid present in the sample. I hope that’s helped clear up the confusion. it`s because I worked with thin-layer chromatography for four years, in my research on natural products isolation, during my project in school, and I never saw the use o it to figure it out the % of products. How can you measure the intensity of the spot, and compare to the others spots? This procedure was only used for quality control, not quantitive analysis. Thank you very much. Here you have a demo video by Alpha Cat.Of course, if you’re looking for really accurate results you should be using other techniques (gas chromatography, etc), but it is a very useful tool to determine whether a plant has certain cannabinoid or not, and the approximate % of this cannabinoid. Can you make a video showing only the quantitive analysis part, please? Hello really interesting and useful article! I would like to try this method myself and already looked for the kits which are pretty expensive. Unfortunately it’s not easy to get Chloroform or Fast Blue B where I am from. Are there any alternatives which i could use? As you mentioned UV-light, could you explain please it in detail? And would the results be the same? The protocol you described with chloroform i notice that you got a excellent separation, in you opinion and experience wich eluent is better: a mixture of hexane-diethyl ether 80:20 or chloroform? Can you Share me the scanned tables included in the cannabinoid test kit from Alpha-Cat for THC, CBD and others?